The final episode of Ten’s game show Family Feud managed just 213,000 metro viewers on Sunday evening, losing its time slot to Seven and Nine’s 6pm news bulletins. Sunday’s result marked the end of the nightly game show, which Ten decided to axe in May after four years. It was hosted by broadcaster and 2DayFM breakfast host Grant Denyer, who most recently won the TV Week Gold Logie for most popular personality on Australian television. Ten’s Family Feud will be replaced from today with new show Pointless, hosted by Mark Humphries, while Denyer will act as co-host of another game show, Game of Games. At the time of Ten’s first announcement, host Denyer said the network was “probably guilty” of driving it into the ground, given it was on six days a week and twice a day, not including All Star episodes. But Ten was the third network Family Feud appeared on. From 1977 to 1984, the show ran on Nine. It was later revamped by Seven, which ran the show from 1989 to 1996. Last night, the show was out-done by Seven and Nine’s 6pm news bulletins, which ran in the same time slot with 1.185m and 994,000 metro viewers respectively. 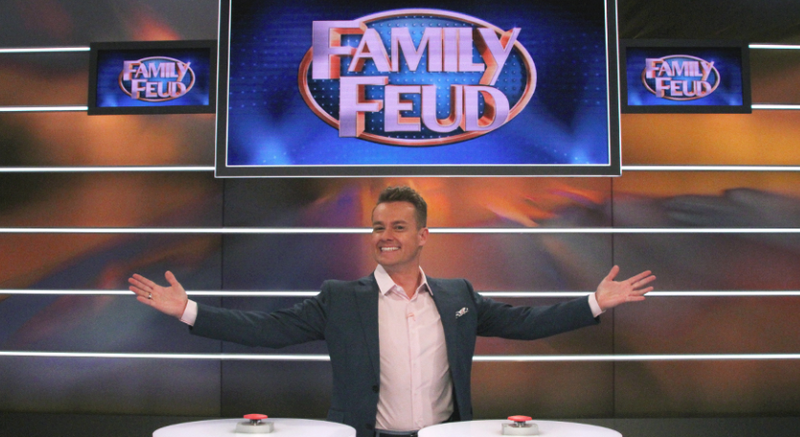 Nationally, Ten’s Family Feud had 314,000 viewers, while Seven News Sunday had 1.804m and Nine News’ bulletin achieved 1.415m. The most watched entertainment show for Sunday evening was Nine’s Ninja Warrior, with a metro audience of 939,000 metro viewers. The program won the 25-54 key advertising demographic and was slightly ahead of rival programs Seven’s House Rules and Ten’s Masterchef Australia. Seven’s House Rules pulled an audience of 928,000 while Masterchef Australia topped the 16-39 and 18-49 demographic, with a metro audience of 854,000. Nationally, House Rules was most popular with 1.507m viewers, beating Nine’s Ninja Warrior, which achieved 1.325m and Ten’s Masterchef Australia, which had a national audience of 1.111m. On the ABC in the same time slot was Grand Designs New Zealand, which managed 516,000 metro viewers. At 8:30pm, the ABC’s program, Jack Irish, was more popular than both Nine’s 60 Minutes and Seven’s Sunday Night. The show pulled a metro audience of 684,000, ahead of Nine’s 60 Minutes, which pulled 602,000 at 8:40pm and Seven’s Sunday Night, which had 599,000 at 8:20pm. According to OzTam’s overnight preliminary ratings, Seven nabbed a Sunday night win, finishing with a 21.5% share over Nine’s 19.8% and Ten’s 11.8%. ABC and SBS had shares of 11% and 5.8%. Total network share was also handed to Seven, which with the addition of multi-channels 7Two, 7mate and 7flix, swelled to 31.1%. Nine’s multi-channels 9Go, 9Gem and 9Life helped the network to a 29.7% share while Ten’s One and Eleven boosted share to 15.7%. ABC Network and SBS Network had shares of 15% and 7.5%. Grant Denyer – the Vanilla Ice of Australian entertainment. Yaba daba don’t. Ended not with a bang but, survey said, the top answer was “whimper”. Big mistake takeing of family feud every night its the one show people got to laugh out loud. I for one won’t be watching the new reality shows thats what they are not good family fun . We will miss family fued. Great show Plus grant. Will not watch pointless. Lets face it the title says it all. POINTLESS!!!!! Bring back family feud!!!!!! Now!!!!! New pointless show is pointless! Omg how can thus happen?? Does the plonker above with the heavy addiction to exclamation marks and likely only a distant relationship to the media industry, (Grant Denyer’s mum perhaps? ), realise Pointless is basically Family Feud in reverse or is the show’s concept to complex for them?